【Larger 360-degree air inlet design + 700ml water tank + Thickened Condenser】 High-efficiency home dehumidifier for removing Damp, Moisture and Mould, remove the moisture up to 300ml/day at 30℃ and 80%RH condition, provide a healthy environment for your family, keep your clothing, bedding, walls and wooden furniture dry. 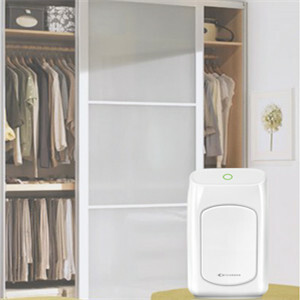 【 Ultra-Quiet air dehumidifier for bedroom】 Remove humidity efficiently but no annoying sound, work noise is lower than 32db. MYCARBON quiet dehumidifier is made of Advanced Peltier Whisper Technology( no compressor), make a better environment for your sleep, work or study but no annoying sound. 【Super Safe mini dehumidifier with Auto Shut Off Function】 MYCARBON dehumidifiers will shut off automatically when the tank is full of water, and the indicator will turn to ORANGE for notice, super safe to dehumidify the moisture when you are sleeping or you are out of the home. 【One-touch operation Air Dehumidifier】 Easy to use, with compact size and lightweight. 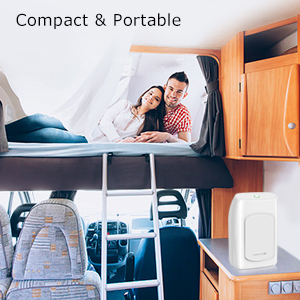 MYCARBON portable dehumidifier is suitable for small places up to 20 square meters, ideal for removing moisture in the Kitchen, Bedroom, Bathroom, Closet, Wardrobe Room, Storage Room, Study Room, office, Caravan, Garage or RV. 【Healthy Life】 Provide a comfortable environment. Remove the moisture, molds, and bacteria, make you breathe healthily, and provide a better environment for your house, office or RV. ★★One year warranty and best service for our customers★★ please feel free to order MYCARBON Dehumidifiers. 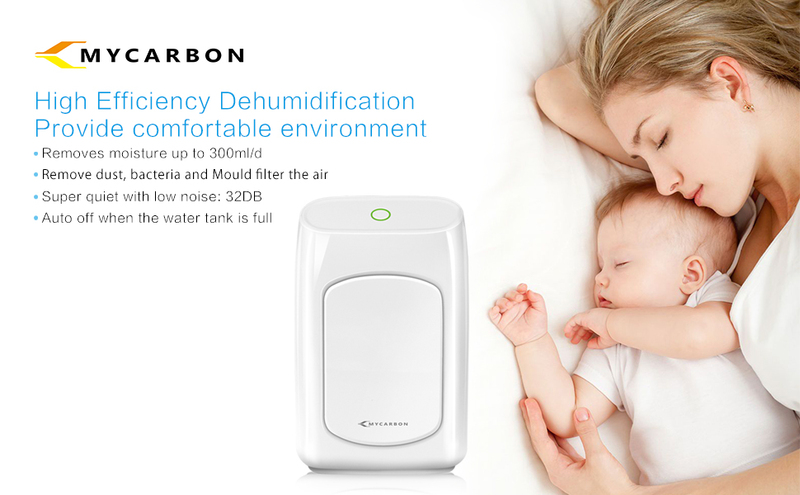 Why you need a MYCARBON Mini Dehumidifier ? 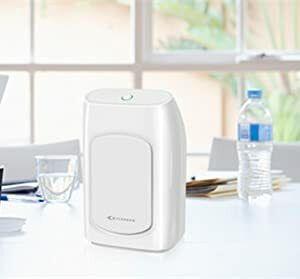 Because MYCARBON Peltier Technology Mini Dehumidifier can help to remove the moisture,molds and bacteria,filter the air to make you breathe healthy,and provide a better environment for your house,office or RV. 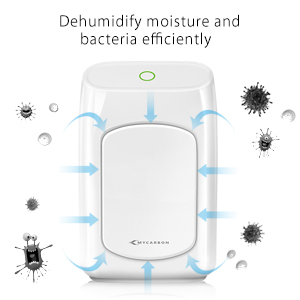 Where to use the Mini Dehumidifier? It's perfect for small room like living rooms/bedroom,wardrobe room,closet,bookcase,kitchen,bathroom,storeroom,small garages,basement,boats, RVs,Caravan,etc. 3. Run your dehumidifier when temperature is more than 30℃ and humidity is more than 50%. We will deal the problem within 24 hours after we received your email. 1.The effect of this dehumidifier is related to the temperature,the humidity and the size of the room. The more humid,the better effect.The smaller the room,the better effect. 2.Ensure the dehumidifier is OFF and unplugged from the wall socket and use a soft cloth to clean away dust or debris from the surface of the unit and air inlets. 3.Do not operate the appliance outdoors. 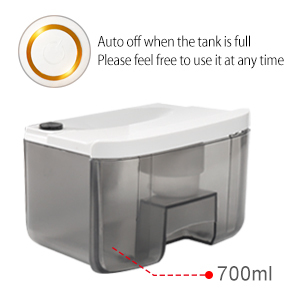 High Capacity with 700ml removable water tank,removes moisture up to 300ML per day in the environment which at 30℃ and RH80%. Peltier technology Dehumidifier is different from the compressor dehumidifier,its operation noise is ultra quiet: lower than 35dB without annoying sound,it runs quietly without interfering with your sleep, work or study. Protect your room from mold, mildew, and bacteria caused by excess moisture. Ideal for absorbing moisture from your Home, Bedroom, Wardrobe,Kitchen, Caravan, Garage, Bathroom, Basement,etc. Creating a comfortable, no mildew & healthy environment for you and your family. please don't worry about the overflowing even if you were sleeping or out of home. Convenient to take the device to your RV and keep the food fresh and clothes dry.